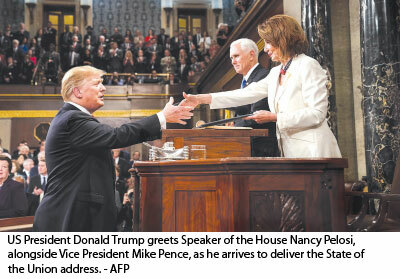 US President Donald Trump delivers the State of the Union address, alongside Vice President Mike Pence and Speaker of the House Nancy Pelosi, at the US Capitol in Washington, DC on Tuesday. 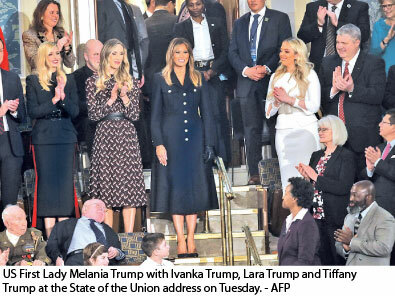 US: US President Donald Trump urged Americans to come together Tuesday in a State of the Union speech seeking to turn the page on two years of divisive turmoil and transform him into a bipartisan national leader. “We must reject the politics of revenge, resistance, and retribution -- and embrace the boundless potential of cooperation, compromise, and the common good,” Trump told Congress and a huge television audience. “We must choose between greatness or gridlock, results or resistance, vision or vengeance, incredible progress or pointless destruction,” Trump said in the speech, which was littered with soaring rhetoric and interrupted continuously by applause from his camp. He touted what he called “the hottest economy anywhere in the world,” and called for a bipartisan push to eradicate the AIDS epidemic in the United States in a decade. But the picture in the US Congress is anything but unified two years into Trump’s presidency, with Democrats controling the House of Representatives, Republicans in charge of the Senate, and Trump finding himself stymied at every turn. After two years of a Presidency in which Trump has driven an already polarized country into bitter, even violent debate over almost every aspect of politics, his words likely fell on many deaf ears. The moment Trump swung onto his favourite topic of building a wall on the Mexican border to stop what he called an “onslaught” of illegal immigrants, Democrats shook their heads and became restless. Trump’s single-minded drive -- and failure -- to get congressional funding for that wall is at the heart of the division that his speech claimed to be trying to resolve. Democrats say that Trump’s warnings about illegal immigrant murderers amount to political fear mongering and they refuse to give approval. The resulting standoff has turned what might have been a relatively minor funding debate into an existential test of political strength in the buildup to 2020 presidential elections. In December, Trump took revenge on Congress by triggering a crippling five-week partial shutdown of government. 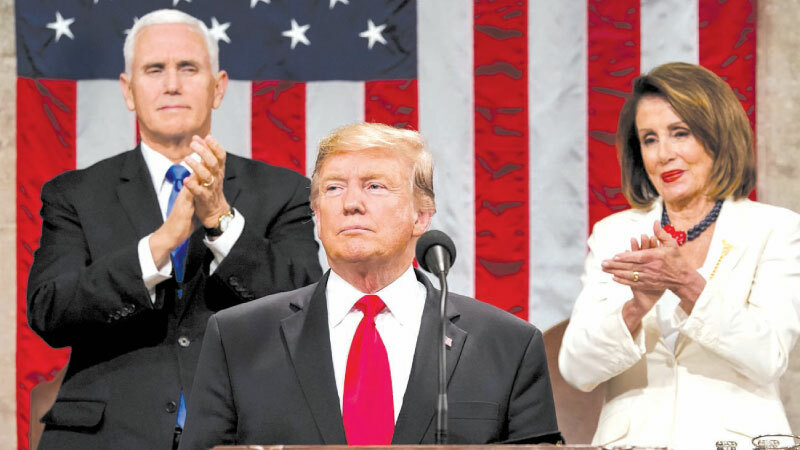 Democratic House speaker Nancy Pelosi, who was seated behind Trump for the State of the Union, exacted her own reprisal by forcing the speech to be delayed by a week. “Great nations do not fight endless wars,” he said. “Constructive” talks with the Taliban guerrillas have “accelerated,” he said in an notably upbeat assessment. There were cheers but the withdrawal promises have been criticized by some in the security services and many Republicans, who fear a loss of American influence on the world stage. Trump likewise gave an update on his plan for a second summit with reclusive North Korea’s Kim, whom he is trying to persuade to give up nuclear weapons. Trump’s speech began by recalling US triumphs in World War II and space exploration. It ended with an oratorical flourish, declaring “this is the time to reignite the American imagination. This is the time to search for the tallest summit and to set our sights on the brightest star.” But it was not at all clear that political foes in Washington were ready to follow.